As a global women’s advocacy organization, WEDO envisions a just world that promotes and protects human rights, gender equality and the integrity of the environment. 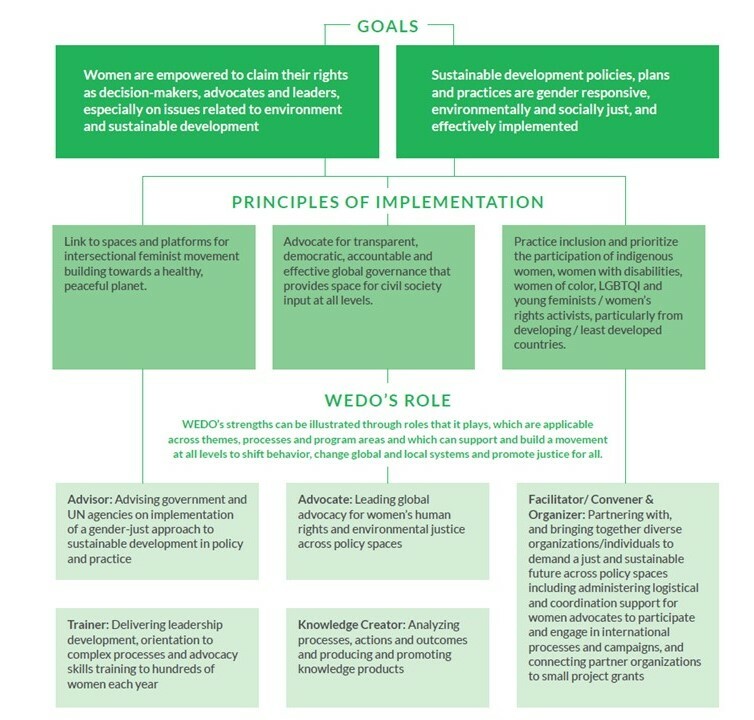 To contribute toward its vision for the world, WEDO’s mission is to ensure that women’s rights; social, economic and environmental justice; and sustainable development principles-as well as the linkages between them-are at the heart of global and national policies, programs and practices. WEDO maintains that diversity in leadership drives better policy; that women, as a result of socially constructed gender roles, are often more directly or severely impacted by negative environmental change while also having a unique perspective for creative and appropriate solutions; and that addressing complex environmental problems must incorporate women’s human rights to avoid increasing gender inequality and violence against women and to secure sustainable development for future generations. WEDO’s goals illustrate what that world looks like. Download WEDO’s 2016-2020 Strategic Plan here. There are many ways you can help us and join us, including making a donation and taking action.